Chris Hardwick is performing at Kingsbury Hall Nov 6, and Utah Geek Magazine is giving away FREE tickets!. The drawing is now LIVE! Complete the entry form here: ugeek.us/ChrisHardwick. Chris Hardwick from The Nerdist and Talking Dead is performing his stand-up comedy at Kingsbury Hall on November 6, and Utah Geek Magazine has tickets to give away! “Like” and/or “Share” the post on Facebook to be notified when the drawings go live! Your first chance to win will be at @Salt Lake Comic Con. Find us at table # Red 8 and sign up to enter the drawing. Your second chance to win will be online through our social media pages in October. 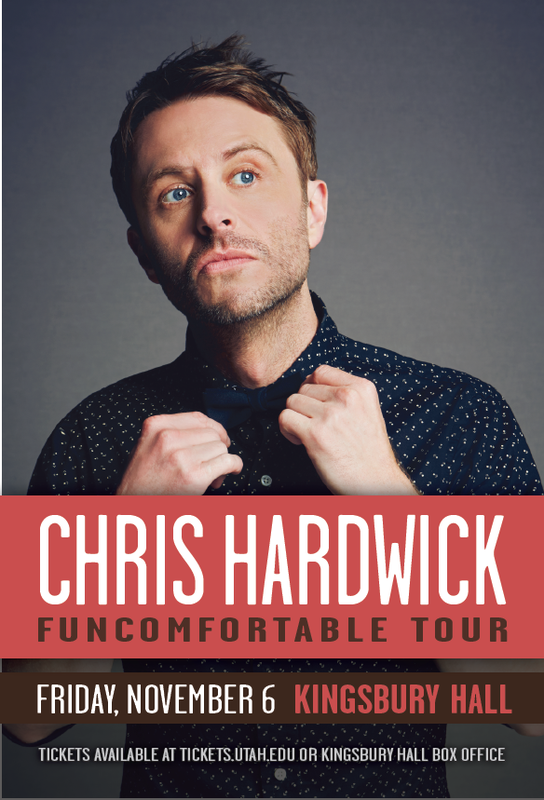 Chris Hardwick, host of Comedy Central’s Emmy-nominated show @midnight, will be bringing his Funcomfortable Tour to University of Utah. The show will take place Friday, Nov. 6, at 7:30 p.m. in Kingsbury Hall. Tickets can be purchased at www.Tickets.Utah.edu, Kingsbury Hall box office or charge by phone at 801-581-7100. Chris Hardwick is a stand-up comedian, chart-topping podcaster, television personality and contributor for Wired magazine. He is also creative head of the multi-platform media behemoth known as Nerdist Industries, which has grown to include the Nerdist.com website, a premium YouTube channel with more than a million subscribers, and a podcast network including the flagship Nerdist Podcast that averages more than six million monthly downloads. On top of his Nerdist responsibilities, he is the face of AMC’s live after show Talking Dead, which discusses the highly-rated The Walking Dead. His top-rated late-night show @midnight airs four nights a week on Comedy Central and his stand-up comedy show, Funcomfortable, is currently on tour.